What Solar Panel And Inverter Brands Can You Trust? 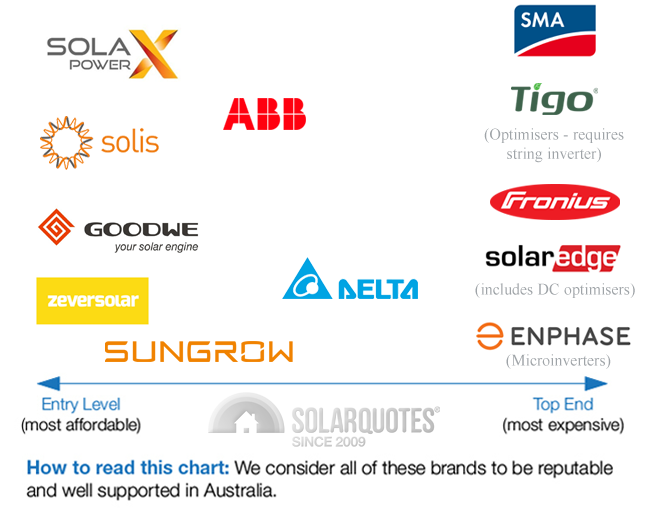 The solar panel and inverter brands that Finn Peacock, a chartered electrical engineer with a decade of experience in the solar industry, trusts. The two questions you need to ask yourself to be confident that you’re getting a great solar power system for a fair price. Learn how to get quotes from quality, pre-vetted solar installers. Great question. It does make it difficult to be confident you’re choosing the right quote when everyone thinks the product they’re selling is the only way to go. The average Australian would have no idea what makes a solar panel (or inverter) brand good or bad. And why should they? This is why I threw my hat into the ring 9 years ago when I started SolarQuotes. I wanted to be an independent, unbiased source of information helping homeowners make a good decision when it comes to installing solar power. So – the simplest way for me to answer the question above is to refer to the following two charts I’ve made of brands of solar panels and inverters that I’d be comfortable having on my own roof. 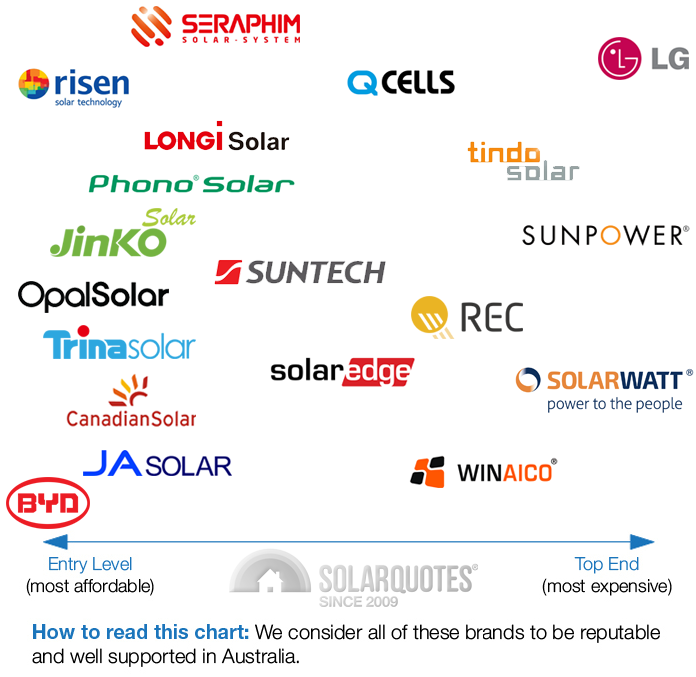 I’ll point out that the brands on the above charts are, essentially, ranked by price and not by quality (there’s a strong argument that price and quality are correlated, but price alone doesn’t inherently make a premium end solar panel or inverter better than a midrange one). When it comes to inverters – you can read about the difference between optimisers, micro inverters, and string systems here. 2) Does the price of my quote correlate with the ranking of the brands? If you can answer “yes” to both questions, then there’s a very strong chance you’re on your way to identifying and buying a solid quality, fairly-priced solar power system. But what about “Tier 1” panels and inverters? Shouldn’t I be going with those? Nope. Tier ranking (where 1 is the ‘best’ and 3 is the ‘worst’) is based on the “bankability” of a solar panel brand (aka how financially stable a manufacturer is), not its quality. And – tier ranking doesn’t exist for solar inverters, only panels. Run far away from anyone who tries to sell you a “tier 1” inverter! As with price, there is a correlation between how financially stable a brand is and whether they deliver quality products – but not always! There are a few tier 1 brands that I personally do not have confidence in. To drive my point home further, the brand of panels that I have on my own roof – Tindo – are not technically tier 1. So don’t stress about getting a “tier 1” solar panel brand. If you stick to the chart above, you’ll be fine. What kind of prices should I be paying for solar in 2019? Note that these prices also include the point-of-sale discount from the federal ‘solar rebate’. Note that costs can increase if you need a switchboard upgrade or other electrical work to make your home suitable for solar power, or if the design of your home makes the system installation more difficult. This article should hopefully leave you feeling a little bit more confident in being able to choose a quality solar panel and inverter brand. For full disclosure – my website works by referring people to up to 3 installers that I’ve personally pre-vetted. The rule is – if I wouldn’t recommend a solar installer to my grandmother, I won’t recommend them through SolarQuotes. Because my website makes money through referrals, people have asked whether that means I have a financial stake in recommending one quote (or panel/inverter brands within a quote) over another. Let me be clear – SolarQuotes generates revenue by referring customers to solar installers. We do not take any kind of commission on sale – so we get paid whether you choose an installer that we’ve recommended or not. 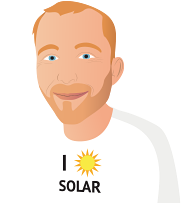 I’m a Chartered Electrical Engineer, Solar and Energy Efficiency nut, dad, and founder of SolarQuotes.com.au. My last “real job” was working for the CSIRO in their renewable energy division.